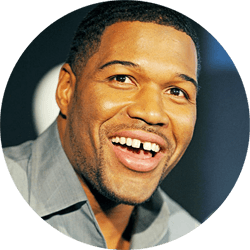 Michael Anthony Strahan was born in Houston, Texas. He is a retired defensive end who spent his entire 15-year NFL career with the New York Giants. Strahan retired with 141.5 sacks, 854 tackles, 4 interceptions, 24 forced fumbles and 3 touchdowns in 200 games. After twenty guest appearances over a two year span, Strahan was selected as Kelly Ripa’s new co-host for Live! with Kelly on September 4, 2012. Strahan was inducted into the Pro Football Hall of Fame in 2014.